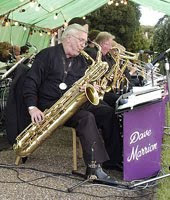 I spent a fabulous evening at the 4th Worcester Park Scouts HQ in Worcester Park last night, enjoying the open air concert by the Dave Marrion Big Band. As darkness fell on a mild late-summer's evening at the tree-lined grounds in Braemar Road, hundreds turned up to eat, drink, dance and enjoy the great entertainment from the band. Hopefully another concert will be organised for next year. It certainly beat an evening at home in front of the telly!